8:10am | Liturgy of the Palms and Procession through the neighborhood and through the doors of the Church. Bring your kids in their strollers or backpacks - we love to sing and shout Hosanna to the Son of David! on the sidewalks of Bangor as we wave palm branches. 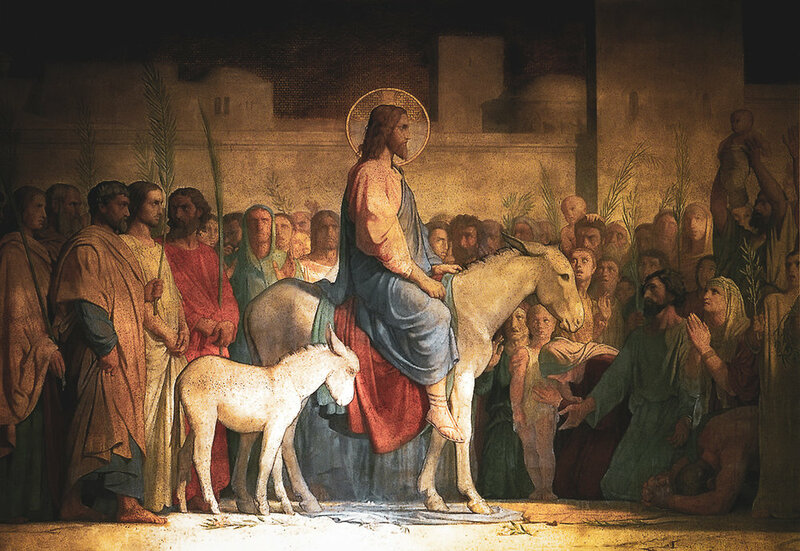 On Palm Sunday, we celebrate the entrance of Jesus as King into the city of Jerusalem on a donkey colt (a symbolic animal of peace). Like a great emperor returning victoriously from war, he was greeted by the crowds with shouts of triumph and joy and waving palm branches, “Blessed is the king who comes in the name of the Lord!” (Luke 19:38). Jesus’ triumphal entry declares to everyone that he is King and Lord and that he will be victorious in his mission to defeat sin and death once and for all. The Passion Reading: This passage from the Gospel is read dramatically by a number of people in order to orient the congregation to the story of Holy Week. The congregation participates in this reading by acting as those who just minutes ago were welcoming and praising Jesus but have now turned against him, calling for his death. We see ourselves in the crowd and realize our own sin of rejecting Jesus so often. In the grittiness and length of the Passion reading, we realize the depth of suffering Jesus endured for us. Since the earliest days, Christians have engaged in set times of prayer throughout the day. “Vespers” is the Latin word for “evening,” or “evening star,” and so evening prayers took on the name “Vespers” among other names. This is a time of settling, of being, of abiding, of allowing the Holy Spirit to examine our own souls as we engage moments of prayer, scripture reading, singing, and quietness. It will be a Service of Light and Evening Prayer from the Book of Common Prayer, with a contemplative presentation made by a lay leader each night. This is the perfect way to fix our gaze for Holy Week. On Maundy Thursday, we gather for Jesus’ Last Supper with his disciples prior to his arrest by the Jewish leaders. On this night, the apostle John recorded that Jesus washed his disciples’ feet and gave his disciples the model for the Eucharist and a “new command” (mandate/maundy) to love each other as Jesus loved them (John 13:34). This service is intensely embodied—we are invited to see, hear, and feel Jesus with us. In the midst of a worship service it feels both bizarre and startlingly vulnerable to strip off our shoes and socks and place our feet in a basin of water. The foot washing portion of the service forces us to be exposed and vulnerable. It is in that place that we can receive healing and the fullness of the Lord Jesus’ love for us. The Eucharist: The meal we share as the family of God in remembrance of Jesus’ sacrifice on the cross. That night Jesus and the disciples shared the Passover meal as the first family of the new Kingdom of God; this meal remembers the most important event in Jewish history, the Exodus from Egypt. Many Jews of the first century were waiting for a Messiah who would lead a military and political takeover of Israel and reclaim it from Rome; they envisioned a second exodus. Bread and wine play a significant role in the Passover meal, and during the Passover meal, unleavened bread (the bread of affliction) and wine (the cups of salvation) are consumed. Jesus connected for his disciples the hope for a second Exodus to the deliverance they would yet experience through his broken body and shed blood. The Stripping of the Altar: We strip the altar of all worship elements and wash it with water. The symbols of Christ’s presence in Communion are removed as a reminder of how Christ was stripped and exposed by the soldiers before his crucifixion and also how his body was washed and prepared for burial by the women. The Shrouding of the Cross: We fast with our eyes through these visual cues of the somber pilgrimage into the last hours of Jesus’ life and his crucifixion. Readings & Prayers: Isaiah’s Suffering Servant poem (Isa. 52:13–53:12) and the sermon to the Hebrews in which the author explains Jesus’ role as our great High Priest and Mediator (Heb. 10:1-25). Then we hear the Passion (John 18:1–19:37). This service also includes the praying of the Solemn Collects in which we intercede for the church, our nation, and the world. Reserved Sacrament: Good Friday is not a Eucharist service because we are remembering that Christ’s body was in the grave, and we are waiting for his resurrected body to bring us new life. In this pilgrimage from darkness to light, hour by hour we walk with the Lord from death to life, until the glorious moment when a Spirit-filled impartation of joy is released and we celebrate that the resurrection is, indeed, real. As we keep vigil through the night with Jesus, we join with believers who, for millennia, have understood the incredible significance of this evening and have given up sleep, despite being near the end of a long pilgrimage, in order to worship and pray. This is how we find ourselves dancing and singing at sunrise on Easter Sunday, sleepless as we may be. The joy of the Gospel overtakes us and we celebrate with childlike freedom the hope that we have as children of the living God. Flowers: After a season of visual fasting, the beauty of the Lord’s resurrection is reflected in the sanctuary being filled with fresh flowers and bright banners, flags, and ribbons.